Ethnicity has been one of the central themes guiding much of my research. It is also at the heart of the University of Cologne Forum "Ethnicity as a Political Resource: Perspectives from Africa, Latin America, Asia, and Europe" of which I am the director. In particular, I have been interested in the expression of ethnicity as a collective identity, its use in political and economic contexts, as well as its role in conflict. Three consecutive projects grew out of this thematic focus. Firstly, a study on interethnic relations and identity politics in northwest Cameroon, which was realised while being a member of the Department "Integration and Conflict" at the Max Planck Institute for Social Anthropology in Halle/Saale. Secondly, a critical examination of recent claims to indigeneity in Africa, centring on the case of the Mbororo-Fulbe in Cameroon; and thirdly, a comparative approach to indigenous rights movements in Africa. These studies have resulted in a number of publications and continue to shape my research and teaching interests. This study examines the structures and mechanisms that either positively or negatively influence the co-existence of different population groups within a culturally and ethnically heterogeneous environment. In order to answer this question, I conducted fourteen months of fieldwork between 2000 and 2002 in the small town of Misaje in the Anglophone northwest of Cameroon, also known as the Cameroon Grassfields. Three population groups are at the centre of my inquiries: on the one hand, the Grassfields groups who make up the majority of the local population and who mainly live on agriculture; on the other, the Mbororo (agro-pastoral Fulbe) and the Hausa who migrated to the region at the beginning of the 20th century, and are predominantly involved in cattle-rearing and trade. While the members of the Grassfields groups are mostly Christians and adherents of African local religions, the Mbororo and Hausa are Muslims and constitute a religious and cultural minority. The study argues that all three population groups have different but coexisting conceptions of their ethnic identity. Their co-existence primarily depends on mutual acceptance. Linguistic, religious, cultural and economic differences are mainly seen in a positive light and are perceived to be complementary rather than problematic. This approach is also supported by state representatives who are keen to celebrate and conserve Cameroon's cultural and ethnic diversity. 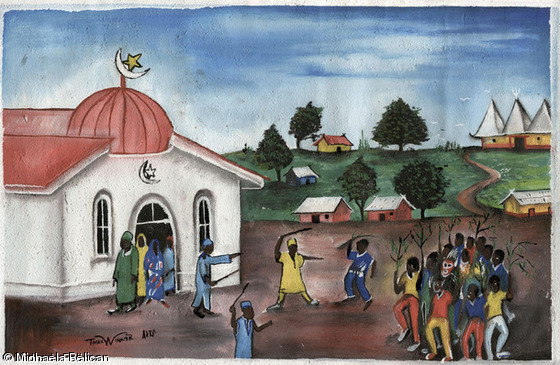 Nonetheless, there are regular disputes between individuals and groups that find expression in farmer-herder conflicts, disputes over land, and witchcraft accusations. While their true causes are often rooted in economic and political rivalry, such conflicts tend to be perceived and expressed in ethnic terms. Significant changes occurred over the 1990s and early 2000s, a period shaped by the country's political liberalisation and the impact of international agents and global rights discourses. As this study argues, local conflict strategies have changed from more confrontational to more procedural approaches. That is, actors increasingly resort to political and juridical strategies at the local, national and even international level. Most striking is the case of the Mbororo who attempt to enforce their land and civil rights vis-à-vis the Cameroonian state with the support of international development and human rights organisations. A more detailed project description is provided on the website of the Max Planck Institute for Social Anthropology, Halle/Saale. In September 2007 the United Nations General Assembly adopted the Declaration on the Rights of Indigenous Peoples. Among its most significant assertions are indigenous peoples' rights to self-determination; to lands, territories, and natural resources; and to free, prior, and informed consent. Activists and organisations concerned with human and minority rights saw the adoption of the declaration as an important step toward the improvement of the precarious situation of many minority peoples. Among the groups that claim the status of an indigenous people in Africa are the Mbororo of Cameroon, Chad and Niger. As from the mid-2000s their representatives have participated in the Indigenous Rights Movement and have made claims vis-à-vis their governments to reassert their rights to land and self-determination. In my study I have focused on the Mbororo in Cameroon and the effects of their claims to indigeneity on their relationship with neighbouring population groups and the Cameroonian government, as well as the contentious responses that have emerged from within the Mbororo community. My contribution ties in with the anthropological debate on the validity and usefulness of the concept of indigeneity, particularly with regard to Africa. As I argue, the notion of "indigenous people" - originally a legal tool developed in the context of UN deliberations - is highly politicised, and is subject to local and national particularities that produce ambivalent, sometimes paradoxical outcomes. In the Cameroonian context, claims to indigeneity collide with preexisting discourses of autochthony. That is, as a pastoralist group and a culturally distinct minority, the Mbororo conform to the international idea of an "indigenous people". Contrariwise, in local perspective they count as "strangers" and "migrants" and as subordinate to the Grassfields groups who consider themselves "first-comers", "natives" or "autochthones" - all terms inspired by colonial legislation, yet deeply entrenched in local understandings of power and authority. Furthermore, as the Mbororo example illustrates, the adoption of the UN Declaration on the Rights of Indigenous Peoples has generated expectations that national governments may be unable or reluctant to fulfill. And without translating into tangible benefits, indigenous identity may lose its attraction and soon fade away, thus giving way to alternative identities and development discourses. Since 2010, I have extended my interest in the indigenous rights movement in Africa to go beyond the Mbororo example and integrate case studies from different parts of the continent. To this aim, I have collaborated with Prof. Dr. Junko Maruyama, Tsuda College, Tokyo, who has worked on the San in Botswana and South Africa (Maruyama 2003). In spring 2012, we organised a panel at the biannual meeting of the German African Studies Association (VAD) in Cologne which brought together researchers from Cameroon, Japan and Germany. It resulted in the special issue 'Indigenous Identities and Ethnic Coexistence in Africa' of the journal African Study Monographs 36(1), 2015. Indigenismo y Etnicidad en Africa por Michaela Pelican, Museo de La Plata, Argentina, September 2015. Movimientos por los derechos indígenas en África: Perspectivas desde Botsuana, Tanzania y Camerún, Centro de Estudios Avanzados, Universidad de Cordoba, Argentina, September 2015.